Along with St. Florian in Hamtramck, St. Mary of Redford is one of two local churches designed by famed Boston architect Ralph Adams Cram. Located on Grand River Ave. east of the Southfield Freeway, its now modest attendance gives little hint of its stellar past: During the 1950s St. Mary’s was one of the best-attended parishes in the Archdiocese of Detroit, with 4,455 registered parishioners, 10,000 in attendance at Sunday Masses, and 2,289 enrolled in the parish schools. In 1951 Msgr. Edward Hickey was assigned as Pastor, and he remained there past his retirement, living in an apartment in the bell tower. An avid sailor, art collector, and founder of the Cloister Gallery at Gratiot and East Grand Boulevard in Detroit, Msgr. 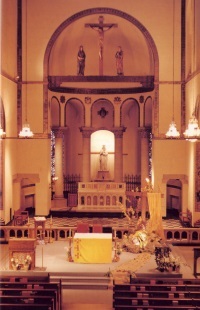 Hickey was known for celebrating a clandestine, private Tridentine Low Mass in the 1980s at 6:00 AM weekdays at the church’s High Altar [1980s photo below]. In recent years, the occasional visiting priest has celebrated private Low Masses at a Side Altar of the still-grand edifice. During the 1990s the church was semi-wreckovated. The High Altar was separated into pieces, its mensa now serving as the freestanding altar. 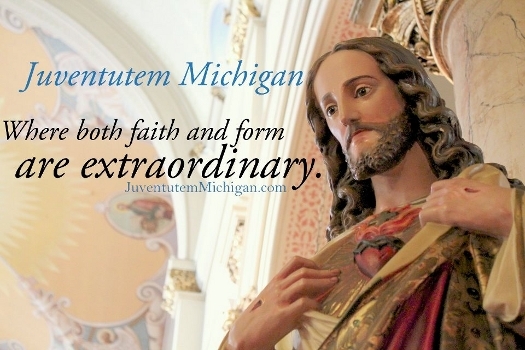 The Archdiocese of Detroit recently appointed Fr. Athanasius Fornwalt, FHS, as Administrator of St. Mary of Redford, effective in July. He will continue his role as Formation Director for the Franciscans of the Holy Spirit, whose brothers study at Sacred Heart Major Seminary; they will now reside at St. Mary of Redford. Readers of this column know that priests of Fr. Athanasius’ order celebrate the Ordinary Form ad oriéntem and have become regular celebrants of the Extraordinary Form as well. We hope to hear of good things happening at St. Mary’s, where the Franciscans will have the opportunity to rejuvenate this once-proud parish. This column has many times noted the return of Communion Rails to many churches across the globe. 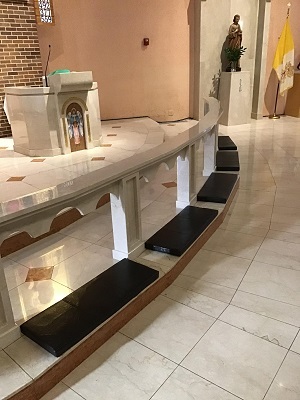 Both construction of new Altar Rails and the putting of long-neglected existing rails back into use for their original purpose are on the upswing. On March 16, Fr. Jerry Pokorsky published an article in which he made several points in favor of bringing back the use of Communion Rails. 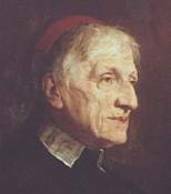 He argues that receiving Holy Communion while standing in a line makes the act individualistic, whereas the sight of the faithful kneeling at the rail is communal and does not encourage a hurried departure back to one’s seat. One quote from the article stands out: “A priest senses the Communion rail and feels he is set apart from the assembly, even as he engages the faithful in prayer. He is more aware of his role as a mediator in Christ in prayer and worship.” How much more do these words apply if Holy Mass is offered ad oriéntem. 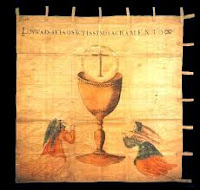 A notable reduction of the Sacred Liturgy during the Sacred Triduum is the suppression of bells. 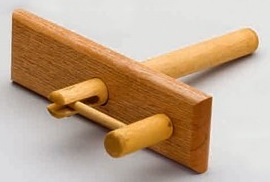 Where hand bells would ordinarily be rung, a wooden clapper called the crotálus is used instead. Bells denote joy, a sentiment which must be set aside as we recall our Lord’s Passion. The clapper instead produces a severe and somewhat startling sound, quite appropriate in light of our Lord’s sufferings. The bells are rung for the last time at the beginning of the Glória on Holy Thursday and will not be heard again until the Glória on the Easter Vigil; instead during that time period we will hear the stark crack of the crotálus.